Wine is an experience, a sensory feast. This is why Miliarakis’ Winery has created wine tasting and wine presentation premises at their facilities in Peza. At the entrance to the winery you are welcomed by a pre-war bicycle which was used to deliver the wine to the city of Heraklion and a historic Blackstone generator, the first to arrive at the village of Peza; it used to produce power for the winery and also supplied half the village with electricity. The restoration of the old winery created four visitable levels, deployed over an area of 900 m2, bearing the name “Sifis Miliarakis”, in honour of the son of Nikos Miliarakis, a dynamic representative of the family’s 3rd generation. A museum, with old wine making machinery: wine presses, pumps, manually operated bottling machinery and a traditional stone wine press. In the same area historic photographs of the winery are on display, among which you will see the Apollo spacecraft astronauts with MINOS wines! A projection room, seating 200 people, with red seats from the old Astoria cinema in Heraklion, where visitors can watch a 20 minute film on the history of wine, olive oil and tsikoudia in Crete, and the long history of MINOS Company. A wine tasting room with furniture from a traditional cafe, seating 145 people. Visitors can taste various labels and become acquainted with the rich and interesting range of company wines, learn about their characteristics and answer any questions they may have concerning wine. 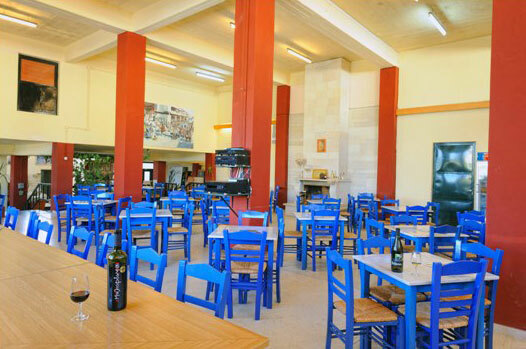 In 2009 a second wine tasting room, with handmade tables created from old winery machinery, seating 55 people and a second projection room for 55 people, were created, which can operate independently from the other visitable areas. Lastly, at the visitors’ retail shop, apart from whine, traditional Cretan select-quality products, such as olive oil, olive soap, spices, honey, local herbs and many more are on sale. The part of the winery that can be visited is open on a daily basis, except for Sundays, during summer months. The rest of the year guests can make special arrangements for their visit by contacting us.